Photo of the Baltimore skyline. 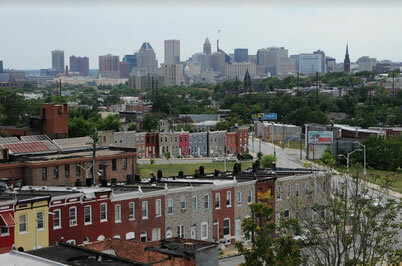 Baltimore is one of four urban research locations officially chartered as an Urban Field Station within the Northern Research Station. As an engaged network, our urban field stations are national and international assets. Morgan Grove, U.S. Department of Agriculture Forest Service. Snapshot : IITF and NRS officially established charters for Urban Research Stations in San Juan, Puerto Rico and Baltimore, Chicago, New York City, and Philadelphia to develop and deliver knowledge that contributes to the understanding of urban social-ecological systems and the adaptation of practices that lead to sustainable, resilient, equitable, and healthy urban environments. The charters formalized long-standing field station investments. Research Location : San Juan, Puerto Rico; Amherst, Massachusetts; Baltimore, Maryland; Chicago, Illinois; New York City, New York; Philadelphia, Pennsylvania. The International Institute of Tropical Forestry’s Director Ariel E. Lugo signed a Charter for the International Urban Field Station with a vision to develop and deliver knowledge on urban social-ecological systems and the adaptation of practices that lead to sustainable, resilient, equitable, and healthy urban environments. The charter officially formalized the long-standing research investments in San Juan, Puerto Rico, as well as other urban systems in Puerto Rico, the Caribbean, and Latin American regions. The Charter builds on the success of the Charter for the “Urban Field Stations in the Northern Research Station” signed earlier in the year and which officially established field stations in Baltimore, Chicago, New York, and Philadelphia. The IITF and NRS Charters serve as a template for other urban investments within the Forest Service, and articulate the principles that have enabled the effective co-production of research with managers and practitioners, and the effective delivery of that knowledge to a broader stakeholder base. The work of the Urban Field Stations is place-based but not place-bound, and can be used to support decisions and improve the lives of the 83% of Americans that currently live in urban areas. The International Urban Field Station will also promote the Forest Service mission internationally by serving as a gateway to cities in the Caribbean and Latin America. In 2016, Northern Research Station (NRS) Director Tony Ferguson signed a charter for “Urban Field Stations in the Northern Research Station.” The charter formalized the long-standing field station investments in Baltimore, Chicago, New York, and Philadelphia by defining what an urban field station is, establishing these four locations as an Urban Field Station Network within NRS, and describing the vision, roles, and functions of that Network. The International Institute of Tropical Forestry (IITF) built on this success by establishing and chartering an urban field station in San Juan, Puerto Rico, which embraces the same vision and operating principles, and coordinates with NRS. The charter serves as a template for other urban investments within the Forest Service, and articulates the principles and practices that have enabled the effective co-production of research with managers and practitioners, and the effective delivery of that knowledge to a broader stakeholder base. The work of the urban field stations is place-based but not place-bound, and can be used to support decisions and improve the lives of the 83 percent of Americans that currently live in urban areas. This builds on the Forest Service’s “all lands” approach and helps to improve quality of life for all people.